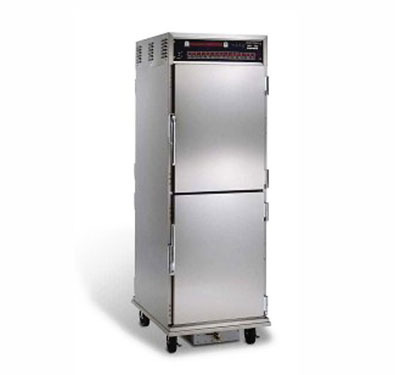 Short Description: The SmartHold patented automatic humidity control system links waterpan heat, fans and ventilation in a closed loop control that lets food service operators measure and maintain precise humidity levels in one-percent increments from 10 to 90% relative humidity. SmartHold full-size holding cabinet with recessed water pan, 5-inch (127 mm) casters. Holds up to 15 full-size sheet pans. (7.6 liters) for operational use. Durable, high-quality stainless steel construction, interior and exterior. Programmable count down timers with single switch start/stop/abort, manual override and power-out memory. Large 3-gallon (11.4 liters) stainless steel recessed heated water pan. Fully insulated doors, sidewalls and control module. Self-closing, lift-off doors stay open past 90 degrees.